Grabbed this book about a month or two ago in Popular bookstore with the promotion '2nd @ 50%'. This is my first Haruki Murakami book. 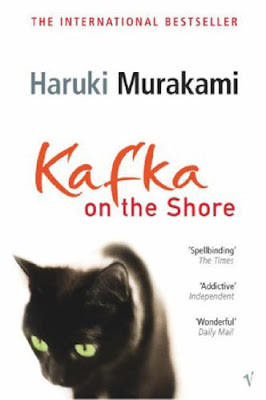 Kafka On The Shore is not the kind of book which I normally read. I don't fancy fantasy novels (apart from Harry Potter series) but this book is kinda different from the normal mythical books I've read. The story alternates between a fifteen-year old Kafka Tamura and an elderly man Mr. Nakata. Kafka Tamura runs away from his father and home, and also in search of his mother and sister. His quest begins as he seeks for answers to his past. Nakata wants to find the half of his own shadow that he lost when he was a young boy during World War II. A mysterious event left Nakata unable to read and 'empty' as he calls it. Many parts of the story remains a blurry element of the novel. The mysterious event of the World War II. Human talking to a stone. There are also unbelievable events taking place in this novel. Talking cats, fish raining from the sky, appearances by Johnny Walker and Colonel Sanders. It is really quite a confusing read. The novel though a page-turner at times, but other times rather confusing. I find the ending ambiguous but somehow this novel makes coherent sense in a way and is rather an interesting and pleasing read. I still have another Haruki Murakami to read. Looking forward to it to see if the style is the same. shuyin, Happy Birthday!!! now that u're a mummy, can't deny that getting OLD d! lol. Many best wishes for the year ahead. I'm sure it will be filled with love and joy as you want Shern grown up! so when r u coming back arr? MAYBE mid-year. but nothing firm.